BMW owners in Europe have traditionally been presented with a wide variety of engine options from which to choose, ranging from a slew of four-cylinder petrol or diesel variants to a few six-, eight- and even 10-cylinder options. Here in the U.S., the pickings had been decidedly more slim for a long time, with the 3.0-liter inline six serving as the smallest measure of cylinder displacement. 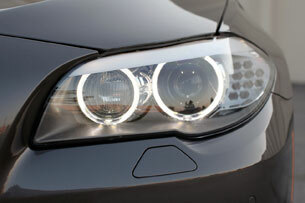 Even the ultra-compact 1 Series could only be ordered with the naturally aspirated or turbocharged 3.0. That changed for the 2012 model year when a 2.0-liter turbocharged four-cylinder hit our shores. This new engine is more powerful than the naturally aspirated 3.0-liter, with 240 horsepower and 260 pound-feet of torque at our beck and call. The engine was a common sense fit for the 3 Series, and early returns show that the 328i may, in fact, be the 3er to get. 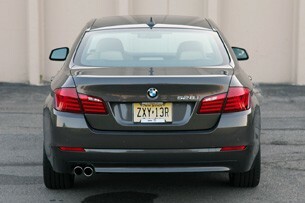 But while the 3 Series was an obvious pairing for the 2.0T, the bigger and heavier 5 Series is a less apparent choice. That didn't stop BMW from offering the engine under the hood of the 2012 528i, and the German automaker didn't even shy away from pairing the mini mill with its weighty xDrive all-wheel-drive system, even though it wasn't even an option in the six-cylinder 2011 528i. We spent a week with a well-appointed 528i with xDrive to see if the new turbocharged 2.0-liter had the guts to motivate 4,001 pounds of German engineering, while still feeling like a luxury sport sedan. We wouldn't mind the engine noise as much if the mill sounded more like the N55 inline six. 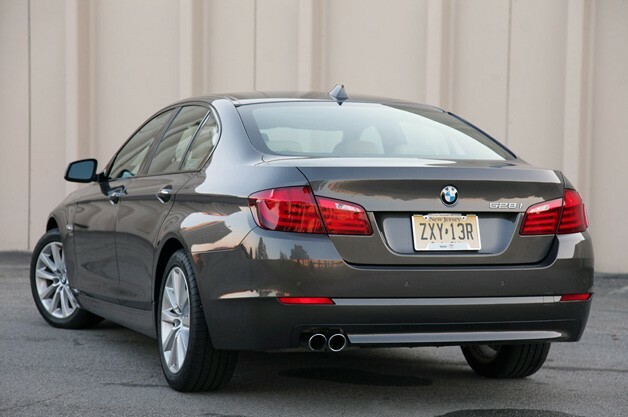 Aesthetically, the 5 Series hasn't changed compared to the 2011 model, though we were very fond of our tester's rich, chocolaty Mojave Metallic paint job – a $550 option. 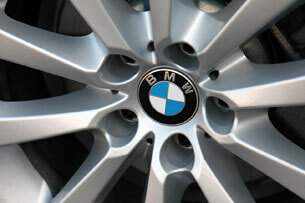 We weren't quite as smitten with the 18-inch alloy wheels, which look a bit too plain and undersized. A set of 20-inch M wheels would add gobs of visual pop to an already pleasing profile, though we'd be very uninterested in that option's $5,870 price tag. 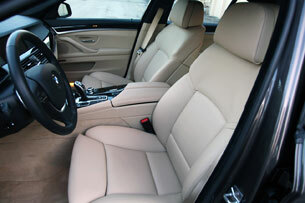 The interior of the 5 Series continues to feature improved materials, superb fit and finish and extraordinarily comfortable seats. And we always love the simplicity of BMW's leather-wrapped steering wheel, which can occupy our hands any day of the week. The same cannot be said for the wonky electronic shifter, which takes plenty of practice to get used to. Pushing up to go into Reverse just seems terribly unnatural, but after a few days it was like riding a bike... backwards. 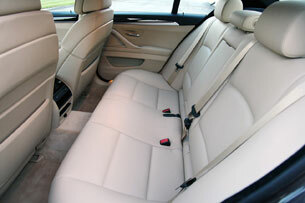 We'd also like more sound insulation to keep the noise from the very hard working 2.0-liter engine out of the cabin. We wouldn't mind the engine noise as much if the mill sounded more like the N55 inline six, but unfortunately this engine is more of an Alto than our ears would like. The xDrive model rings in at a full $2,100 more than its rear-wheel-drive sibling. The 528i is the least expensive of all 5 Series models, but our tester was weighed down with over $12,000 worth of options, or nearly enough cash to purchase a Hyundai Accent. Among the myriad of options available on our tester were the Cold Weather Package ($1,450), which adds a heated steering wheel, first and second row heated seats and retractable headlight washers. The Premium Package ($2,250) adds a power tailgate and Park Distance Control, while the Sport Package ($3,600) adds 18-inch wheels, dynamic damper control, an Anthracite headliner and multi-contour seats. And then there are the stand-alone options, which include the sport automatic transmission ($500), keyless entry ($1,000) and iDrive navigation ($1,900). Unfortunately, about half of those options can be had on typical top-trim midsize sedans for about half the price, but we're talking about a BMW here, so the exorbitant price point is expected. At least the USB, Bluetooth and leather-wrapped steering wheel are all part of the price of entry, but again, even the typical Toyota Camry owner can say the same. 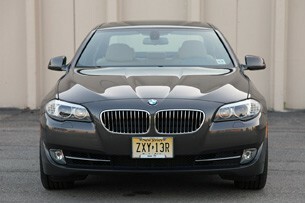 As for this xDrive model, it rings in at a full $2,100 more than its rear-wheel-drive sibling. The option packages were nice, but we were most interested in the performance of the little 2.0-liter turbo four. 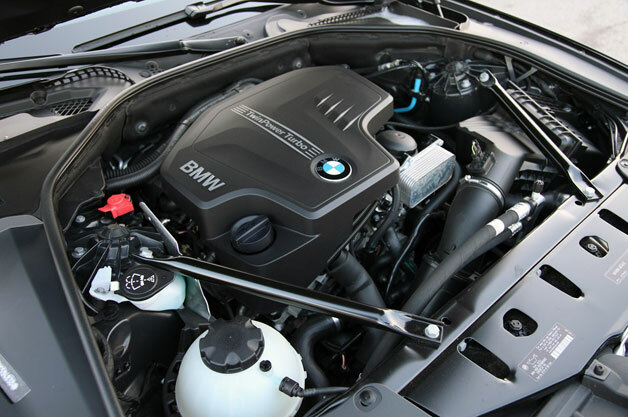 The engine, which boasts BMW's TwinPower Turbo tech, packs decent punch with 240 horsepower at 5,000 RPM and 260 pound-feet of torque at a scant 1,250 RPM. That last number is most important, since this brawny Bimmer has to power all four wheels on a full-time basis. The ZF-sourced eight-speed automatic transmission offers smooth shifts and improved fuel economy, and don't look to pass over the eight-speed slush box in favor of a six-speed manual, because the do-it-yourself option isn't even offered in the 528i. On the road, this BMW has a split personality. Drive leisurely around town and the turbo-four feels sluggish and even disinterested. This feeling of driving in Jello is underscored by the fact that the 5 Series feels like a tank on the road, with a wide stance and road-hugging suspension tuned for spirited driving. At first we were put off by our tester's less-than-ideal cruising characteristics, but then we heard a commercial for the 5 Series that led to a revelation. The radio spot bragged that the 528i (non xDrive) can go from zero to 60 in 6.2 seconds, a number that we just didn't believe. Yet once we put a little effort into the driving experience, the powertrain came alive with plenty of torque from the moment you say "Go!" and linear power delivery, at least at lower speeds. We did notice that the 2.0-liter began to struggle some at highway speeds, but that's to be expected with an engine this size lugging around a car this size (and driving all four wheels). The new powertrain feels more responsive off the line and every bit as worthy of the BMW badge. Now, keep in mind that we're talking about a turbocharged four-cylinder and not a twin-turbo V8-powered 550i, so "plenty of torque" and "linear power delivery" should be taken in proper context. Compared to the naturally aspirated 3.0-liter inline-six it replaces, the new powertrain feels more responsive off the line and every bit as worthy of the BMW badge. 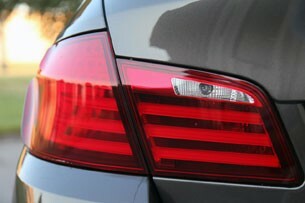 Further, the 2011 528i and its seven-second zero to 60 time was nothing to Tweet home about. Aggressive driving is even easier when selecting the Sport mode button located on the center console to the left of the shifter. In Sport mode, the engine is more responsive, the suspension stiffer, the gearshift timing is abridged and the steering loses some of the power assistance that makes electronic steering a bit of a drag. And this is a BMW, so it also comes fitted with an impressive suspension setup and brakes with plenty of bite. Our xDrive-equipped tester scores an EPA-rated 32 mpg highway and and 22 city. 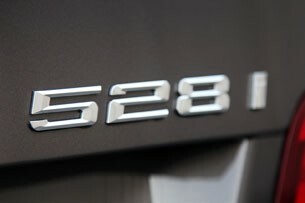 Sporty handling is a major tenant of the BMW driving experience, and the 528i delivers the goods. The handling is aided by twin-tube gas-pressure shocks, an independent double-wishbone front suspension and an independent multi-link setup out back. xDrive – which defaults 40 percent of the engine's power to the front and 60 percent to the rear – kept the 245/45-series all-season Goodyear tires planted at all times. The system can also route additional power back and forth whenever wheel slippage is detected, so between the advanced AWD system and the well-engineered chassis, our tester felt very planted on the road, with little body roll and untraceable wheel slippage. The result is a sport sedan that offers as much confidence to the driver as any vehicle in its class, even if BMW purists will tell you that 5 Series of yore had a much more dynamic chassis. Given that the engine has been downsized quite a bit, it stands to reason that fuel economy has improved. The last generation (2010 model year) xDrive 528i could manage only 25 miles per gallon on the highway and 17 mpg in the city. That number improved dramatically with the introduction of the 2011 528i, which could achieve 32 mpg on the highway and 22 mpg city, thanks largely to the addition of an eight-speed automatic transmission. The turbo-four-equipped 2012 528i has improved further to 34 mpg highway and 23 mpg in the city, and our xDrive-equipped tester scores 32/22 numbers. We're convinced that the turbo 2.0-liter deserves a permanent place under the hood of the 5 Series. Compare the 528i's EPA estimates with that of the all-wheel-drive equipped Mercedes-Benz E-Class and the 5er looks even more impressive. The Mercedes can only manage 28 mpg on the highway and 19 mpg in the city. During our week with the vehicle, we averaged an impressive 26.4 mpg in very mixed driving, which is an impressive figure for a sporty large sedan that hits 60 in just over six seconds. After a week with the 2012 528i xDrive, we're convinced that the turbocharged 2.0-liter four-cylinder deserves a permanent place under the hood of the 5 Series. The engine is both responsive and efficient, and it delivers the added benefit of also being more powerful and torque-rich than the outgoing 3.0-liter inline six. Couple that engine with an excellent all-wheel-drive system and an already proven chassis and the 2012 528i continues to be the main force to be reckoned with in the midsize luxury segment.